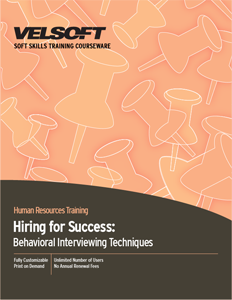 Behavioral Interviewing Training Materials are designed for trainers to teach human resources staff how to use techniques to hire for success! Confidently develop HR managers’ ability of determining the skills needed for a position, advertising guidelines, screening résumés, interview preparation techniques and more! Seeing is Believing This sample manual to teach Behavioral Interviewing is in MS Word format. If you're looking for detailed, high-quality, customizable training materials on interviewing skills and successful hiring, this two-day course is just what you're looking for! Behavioral Interviewing Training Material will help train your HR managers the phases of the hiring process, as well as detailed information on many types of interview questions (including behavioral techniques, critical incident questions, holistic questions, and achievement-oriented questions). Behavioral Interviewing Training Materials include a pre-assignment, detailed instructor guide, student manual, pre and post assessments, quick reference guide, and more. If your students like to learn from their mobile devices, ask about our blended learning.